We moved house in the spring and, having our pick of locations and a decade’s experience of riding in Edinburgh, are now out beyond the bypass. The old railway on the Water of Leith (to the canal and NEPN) has supplanted the Quality Bike Corridor as our local bike infrastructure. If I want to, I can get from the Pentland hills over twelve miles to our office by the shore with just a few minutes riding on quiet back streets (and one traffic light!) 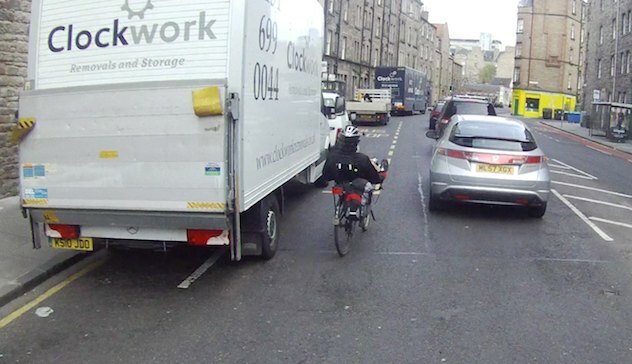 and cyclist numbers are just exploding, with virtual traffic jams on the canal and North Edinburgh Path Network as large numbers of ordinary looking people take to two wheels in an environment free of the tender mercies of the Edinburgh motorist. I had to return to our Newington flat this week to do some landlording, and after a few weeks the contrast between segregated paradise and the absolutely terrible “infrastructure” that was provided under the branding of the “Quality” Bike Corridor could not have been more apparent. One of the striking design principals behind the QBC was that it painted gutter lanes wherever the road was wide (and thus cyclists were relatively unlikely to be troubled by vehicular traffic in the first place) but did virtually nothing to address any of the difficult spots that lead to conflict between vulnerable road users and speeding vehicles in practice. 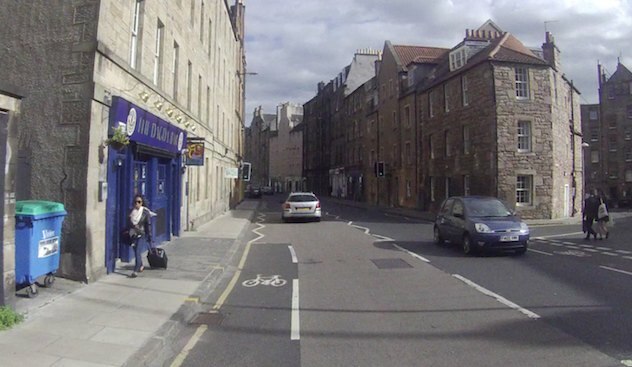 One of these is the junction with Gifford Park on Buccleuch Street, pictured above/below, where there is a pinch point in the building facades and barely enough room for two vehicles to pass, never mind bikes. As you can see, SFA has been done to accommodate southbound cyclists here. The cycle lane disappears heading into the constriction, effectively throwing riders under the tender mercies (or wheels) of the traffic stream. The other day I must admit I wasn’t paying as much attention as usual, since I was going at a fair pace and there was nothing coming the other way – you can see I’m shaving the give way lines rather than sitting in the middle of the lane as the Government’s Bikeability scheme would suggest is the correct way for ordinary citizens to manage rush hour traffic. 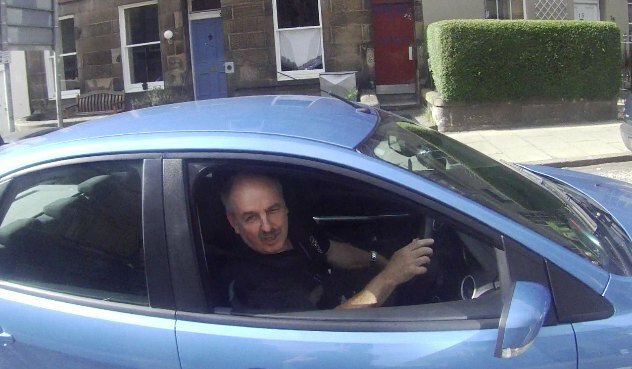 Fortunately an Edinburgh motorist was on hand to punish my audacity with a horrendous overtake (at least they had the courtesy to blast their horn to warn me they were going to shave my elbow). 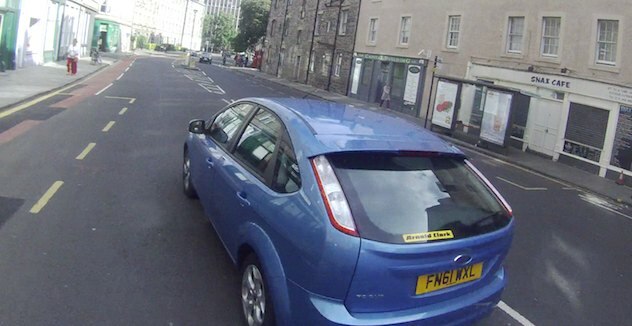 Obviously the driver, a University of Edinburgh employee judging by his neck pass, got stuck in traffic just a few yards further on, so I was able to ask him for his views on this section of the QBC. I believe “animated” and “colourful” would be fair descriptors. There was absolutely no question in the mind of Mr Corbett (if I caught his name correctly) that scraping past cyclists when he might otherwise be required to use the empty oncoming lane was fair game. (This episode of driving was recorded in full HD, but I’ve decided to withhold the footage in case it might be relevant to a future prosecution). Ultimately, I don’t hold civic bodies responsible for the behaviour of every motorist who drives inside the bypass (it would be nice if the police made it easy for cyclists to report dangerous driving and acted on said reports, but that’s another story). However, if I wasn’t already a committed cyclist this driving episode, on the “Quality” Bike Corridor no less, would certainly have converted me back into a regular motorist. It is much more difficult to forgive the creation (or lack of creation) of quality infrastructure. Here’s the same pinch point heading north earlier in the year, for instance. It’s like this all the time: where are the wardens ticketing everyone who stops in the bus stop and cycle lane, throwing families who might otherwise want to use this so-called “Quality” corridor out into the most horrendous meat-grinder? Obviously, said families are conspicuous in their absence, and who can blame them! Apparently enforcing restrictions would be unrealistic or unfair to local business. This gives the Council the basis of a cunning plan – publish a design which nominally shows areas where cyclists are protected from traffic, but then never enforce it, both avoiding any risk of an objection to the design by pesky cyclists or offending anyone who wants to park over the top of it. What could be more depressing than that the only modification made to the Quality Bike Corridor since it was installed was to ease loading restrictions on an already inadequate cycle lane? 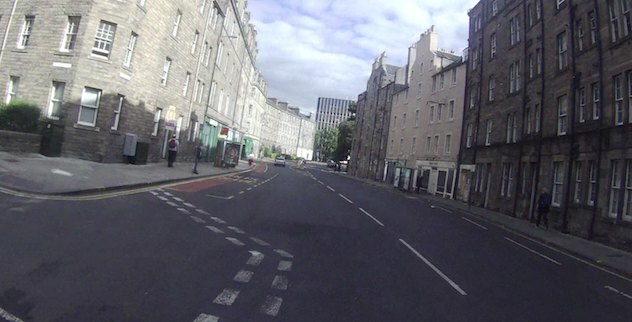 Leith Walk does give us some hope, but the effort required to engage with the Council on it (and certainly to suggest small but key improvements to the latest designs) is just beyond me.